Saves can be imported from Dragon Age: Origins. SecuROM 7 DRM in .exe file. Steam CD key can be activated on Origin. All of the DLC is now available in a bundle on Origin. Hi-Res Texture Pack - greatly improves the texture quality. If the game is on Origin, then the texture pack can be downloaded as free DLC. Patch 1.04 is the latest. Change the line DisableIntroMovies=0 to DisableIntroMovies=1 and save the file. Syncs save games. No cross-platform sync between Windows and OS X. Use Widescreen Fixer with this plugin to fix HUD position. Works with Windowed Borderless Gaming. 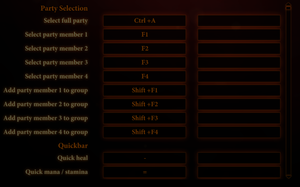 In WBG settings make sure to set the resolution to your native res, to avoid inaccurate mouse placement. 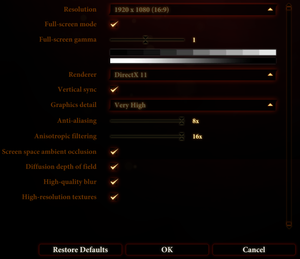 Can be enhanced to SGSSAA via Nvidia Inspector. 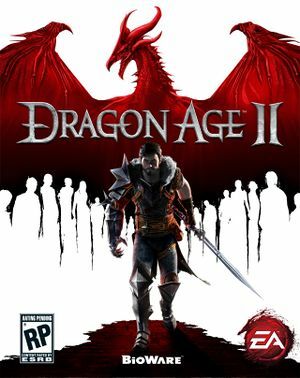 See Helix Mod: Dragon Age II [DX9] or Helix Mod: Dragon Age II [DX11] - 3DV-Ready Fix V1.2 - Losti. Retina display does not support 1024x600 default resolution and fails to display window. Game otherwise runs in the background. Play button appears but does not launch the game. ↑ 1.0 1.1 File/folder structure within this directory reflects the path(s) listed for Windows and/or Steam game data (use Wine regedit to access Windows registry paths). Games with Steam Cloud support may store data in ~/.steam/steam/userdata/<user-id>/47900/ in addition to or instead of this directory. The app ID (47900) may differ in some cases. Treat backslashes as forward slashes. See the glossary page for details.